Trinity River Railroad Swing Bridge, Trinity County, Texas. The bridge was originally constructed to allow steamboat and barge traffic to pass, but it's been some time since a barge has passed and even longer since steamboats have been seen on the Trinity. 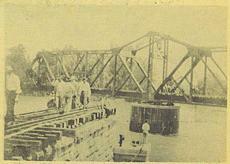 The first railroad bridge had been constructed in the early 1870s when the Houston and Great Northern railroad came through the area. The bridge featured here was constructed by the International and Great Northern Railway and was actually built in Wisconson and shipped to Texas where it was erected on site in 1916. The length of the bridge is 294 feet and when the trestles and approaches are included, the length reaches nearly 3,000 feet. The swing mechanism revolves around a massive pin embedded in cement and (in theory) it can be turned manually. 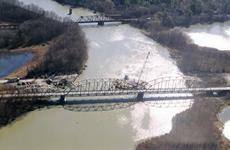 In its long history, the bridge has only been "swung" open on two occassions. Once being a flood in the mid 20s when it was opened to prevent driftwood and sawyers from piling up against it. 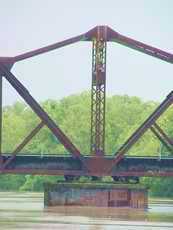 Texas has two other swing bridges. 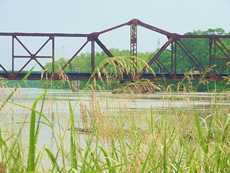 One across the Brazos River in Brazoria County and one over the Rio Grande connecting Brownsville with Matamoros, Tamaulipas, Mexico.